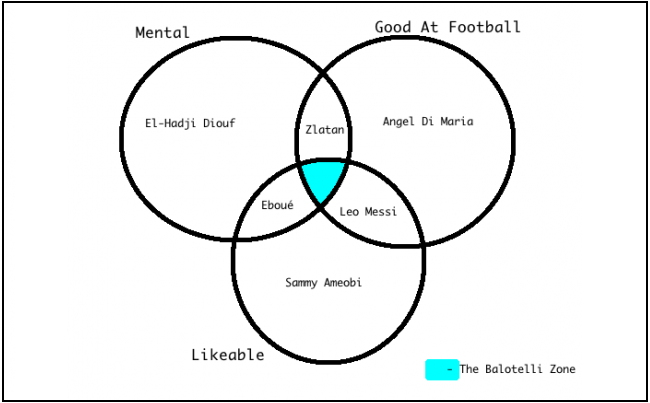 Anorak News | Manchester City’s Mario Balotelli Is Mental, Likeable And Talented: Who Else Is In His Zone? Manchester City’s Mario Balotelli Is Mental, Likeable And Talented: Who Else Is In His Zone? THE Balotelli Zone is where Manchester City’s Mario Balotelli lives. He is as good at football as he is mental as he is likeable. Who else is in the zone? Eric Cantona? But did anyone outside Manchester United’s walls like him? Stan Bowles? Zinedine Zidane? Paul Gascoigne?